Tuscany is a beautiful Italian region that has captured the imagination of the English like only a few other area in Europe. 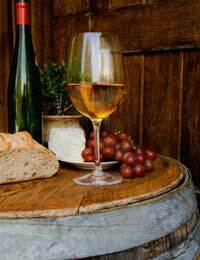 Its lush countryside stunning artistic and architectural merits, coupled with its brilliant knack for producing both great food and wine make it an ideal destination to develop new tastes for the local ‘vino’. The capital of Tuscany if Florence, which is culturally ideally suited to safe terrace wine consumption: Just sit back with some good pizza, a selection of meats, a great wine, and take in the ultra stylish passers by, who, as it happens, will be generally hugely flattered by your interest! Italians are experts in their own culinary culture, and any Italian will be more than happy to divulge as much information as they can about local food and drink. As in Italy wine and food vary so enormously from one region to another, the only way to really get to grips with a wine growing region is to visit it. Trying an Italian supermarket wine with a frozen pizza just doesn’t match up! Until you can visit Tuscany, however, it is possible to source good Italian wine, and with a little effort it may be possible to cook up a good Italian style accompaniment as well. Remember, the key to Italian dining is simplicity – a good robust wine with some simple sturdy food will suffice for a whole evening’s entertainment. Finally, before we explore different varieties, it must be noted that in order to enjoy wine like the Italians it may be necessary to talk like the Italians. By this, it is not suggested that you learn to speak Italian, but rather that you learn to talk the hind leg off a donkey – this way the wine is consumed more slowly and the drunkenness that may later ensue is a mellow, tipsy one! This is a significantly different experience to drinking in the U.K! The most famous of all Tuscan wines is Chianti, a red wine produced in the Chianti region. It is the first wine region in Italy to have had its borders legally certified (1932), signalling the seriousness with which Chianti is treated. The Chianti region is diverse, and therefore it is difficult to give a precise definitive account of the properties of a Chianti. Chianti is made from the Sangiovese grape, which has elements of summer fruit and spices, and varies greatly in quality. Note, that as with most Italian wines, the Italians tend to keep the best produce to themselves. For this reason Chianti may be associated with poor wine in the U.K. However, high quality Chianti’s, of which there are many, are coming to prominence on the back of a general wave of Italian wine appreciation in Britain. Other top Tuscan wines include Vino Nobile di Montepulciano, also primarily incorporating Sangiovese, and Carmignano, which incorporates a blend of many grapes. There is a distinction between Chianti and Chianti Classico – wines from the latter being produced in a region known for producing ‘Chianti’ prior to the new 1932 classification. It is often felt that these wines are of a higher standard. Tuscan cuisine relies heavily on meat and simple breads: Accordingly it is appropriate that the spicy notes of Chianti help to cut across the heavy and tough nature of the local fare. Chianti and other Tuscan wines go well with hard cheeses such as Parmesan, red meats, stews and game.